Everything you need to know about visiting the Statue of Liberty (Liberty Island, New York, 10004). Since 1886, the Statue of Liberty has held her torch high in New York Harbor as the quintessential symbol of American liberty, and no trip to NYC (perhaps no trip the United States), is complete without a visit to the Mother of Exiles at Liberty Island. 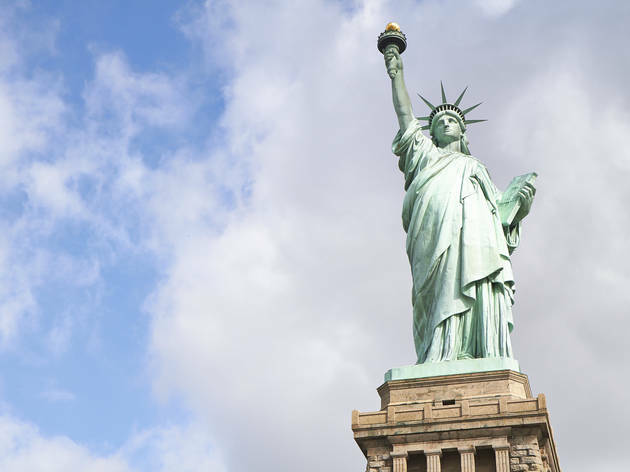 The statue’s massive pedestal houses an observation deck as well as exhibits detailing the fascinating history of the 305-foot copper statue designed by Frédéric Auguste Bartholdi and gifted to the U.S. from France to celebrate the friendship of the two nations. Check out the original torch and read the bronze plaque with Emma Lazarus’s poem “A New Colossus” (you know, the tired, poor, huddled masses yearning to be free). 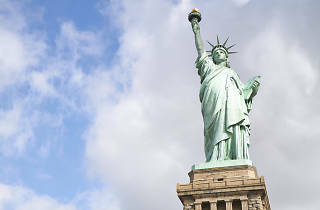 The National Park Service offers daily tours of Liberty Island as well as neighboring Ellis Island, which served as the first stop for more than 12 million immigrants between 1852 and 1954. While admission to both parks is technically free, visitors must buy ferry tickets to get there. Be sure to book online well in advance, as day-of tickets tend to sell out quickly—especially in the summer months. Access to Lady Liberty’s crown was closed to the public after 9/11, but beginning in 2009, a limited number of daily visitors are allowed to climb the 354 steps and enjoy the stunning view. But the trek—which can take three or more hours and is roughly the equivalent of 20 stories—isn’t for everyone. At 19 inches wide, the steps are steep and head clearance is just 6’2”, plus it can be up to 20 degrees warmer inside than outside, making it a no-go for anyone with claustrophobia, vertigo and heart or respiratory issues. Tickets, which must be purchased through Statue Cruises, fill up quickly, so it’s recommended that you book online three months or more in advance. For a truly memorable fete, throw your next bash at Liberty Island. Since the 1930s, the spot’s been hosting weddings, corporate events and other parties at Ellis and Liberty Islands. Companies like Evelyn Hill will arrange food and bar packages customized for each group of up to 350 people, or it can help coordinate with approved outside vendors. You can even end the evening with fireworks show. But no promises Lady Liberty won’t upstage the bride. Liberty Island has been under the jurisdiction of The National Park Service since 1965, and any child with an interest in history and nature should check out the Junior Ranger Program. They can even sign the junior ranger pledge after their visit to see Lady Liberty. Our New York editorial team is constantly updating and reviewing the best attractions, activities and venues across the city, so that you're always in the know, with the best of NYC. at your fingertips. The Statue of Liberty was most recently updated with new tips on June 30, 2017. Took a boat ride along the most famous attractions in New York and luckily enough managed to fit the Beaut Statue of Liberty. She is immense, sheer beauty shines through her, carrying her torch. Such a shame we didn't get a chance to get off the boat, would have loved to get up close and personal. But what a view from the boat, she is a stunner indeed. The trip across the harbor is fun and you can envision what is was like to see this after crossing the Atlantic. There is a museum in the base of the statue that will provide you will all facts and answers you want to know. I was able to walk up, but not too far into statue. The views of Manhattan are spectacular and the island and its history are a great reminder of how that city got started. Good ol' statue of liberty. The statue that everyone wants get close to and see on like, every boat ride. lol. She looks quite majestic from afar, but I would urge you to make the trip to Ellis Island and see this beauty up close and personal. To be honest, I've lived in New York for 25 years, and only made the trek over when I was 23. Sad, I know. I guess I considered it too touristy and out of the way so I avoided it for a while. Don't avoid it! There's shops and food and lots of areas to explore on the island to keep you entertained. If you have the funds, I would implore you to go inside the statue. If possible, all the way to the top. Don't get me wrong, getting to the base is cool and all, but it's much cooler to know that you made the (very) long and tiring climb all the way to the top. Plus only a few people can be in there at a time so it's a very personal experience. I happened to climb up at a time when people went down so I had the crown all to myself! hehehehe. Looking out at that height is something else. Plus I can say I've been in the statue of liberty's crown! It's awesome. On my way leaving the island, I got some peeps to take a cool shot sitting at the base of the statue with the statue in the background which was pretty dope. All in all, make it over to this iconic New York place! The Statue of Liberty or as some people like to call her, Lady Liberty, is an American landmark symbolizing hope, freedom, and democracy among other things. It is nearly impossible not to get emotional while visiting Liberty Island, as you think of what this statue meant and still means to so many people from all over the world who come to the US for a better life. She towers over the Hudson River looking towards the great city of Manhattan with a watchful and protective look in her eyes. She is one of the most important figures that represents the American Dream. A visit to the Statue of Liberty is a must on any trip to New York City. Iconic of the nation's history, the statue of liberty represents a lot of things (good and bad) to the democratic process, and helps connect us to our place in time. A lot of what it represents to me is intertwined with Ellis Island and the immigrant story, as the first sight of liberty in a new world. While there are many other narratives as well, climbing the statue, meant a lot to me - though it's true that due to constant maintenance there are a lot of caveats as to where you can go, and what you can see (there are much better views elsewhere) - I found it integral to the NYC experience. As another sidebar, there is never a good time, it is always packed, and it is always packed with tourists. Be forewarned. Liberty Enlightening the World (to give the monument it's full and proper name) is a must-see New York landmark that has been the symbol of America to the rest of world since 1886. The story behind the statue's conception, manufacture in Paris, delivery from France, and construction on the former Bedloe's Island is an amazing tale of Frederic Bartholdi's unshakeable vision and determination, assisted by the not-inconsiderable efforts of a couple of guys named Eiffel and Pulitzer. When I was a kid I climbed the spiral staircase up to the crown, still the only way to get to the top. Sailing out of New York Harbor on a cruise ship, I've witnessed a detectable list to starboard when we pass "Lady Liberty," as everyone on deck rushes to the rails to get a picture. Liberty Trivia: there's a miniature copy of the statue on a Paris bridge, and on top of the former Liberty Warehouse on W. 64, east of B'way. I came to visit the Statue of Liberty back in 2008 when visitors still weren’t allowed to go up to the top (because of 9/11). I was with my dad and brother, and we mostly visited because we felt like we should. Interestingly, the trip out to the statue and Ellis Island got my dad talking about his experience immigrating to the US which made me appreciate this attraction so much more. It’s not just a tourist trap, it’s a symbol that means a lot to people that restarted their lives in America.